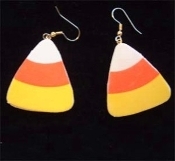 CANDY CORN EARRINGS-Halloween Fun Foam Charm Jewelry-Med: 1-3/8"
Team-Zebra Funky Jewelry >> CANDY CORN EARRINGS-Halloween Fun Foam Charm Jewelry-Med: 1-3/8"
Big CANDY CORN EARRINGS - Halloween Fun Foam Costume Jewelry 1-3/8" - MEDIUM-size Colorful original Orange, White and Yellow Lightweight charm. Approx. 1-3/8" tall.